New Liturgical Movement: Bethlehem Icon Centre Featured in Daily Mail, Times of Israel, Yahoo News and...Drudge! Bethlehem Icon Centre Featured in Daily Mail, Times of Israel, Yahoo News and...Drudge! It was with pleasure and surprise that I noticed that an article about the Bethlehem Icon Centre, its founder and director, Ian Knowles, and its patron, the Melkite Byzantine Catholic Bishop of Jerusalem, has caught the imagination during Holy Week. 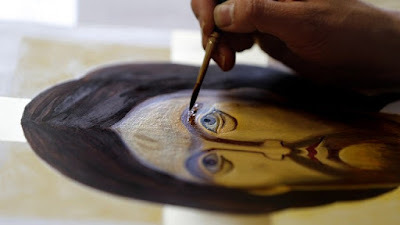 The same piece has appeared in the Daily Mail and the Times of Israel; it was then picked up by Yahoo News, and from there by the Drudge Report, of all things, where, where, among the political headlines, the link appears with the title “Ancient sacred art resurrected in city of Jesus’ birth”.